An ancient virus has "come back to life" after lying dormant for at least 30,000 years, scientists say. It was found frozen in a deep layer of the Siberian permafrost, but after it thawed it became infectious once again. The French scientists say the contagion poses no danger to humans or animals, but other viruses could be unleashed as the ground becomes exposed. Professor Jean-Michel Claverie, from the National Centre of Scientific Research (CNRS) at the University of Aix-Marseille in France, said: "This is the first time we've seen a virus that's still infectious after this length of time." The ancient pathogen was discovered buried 30m (100ft) down in the frozen ground. 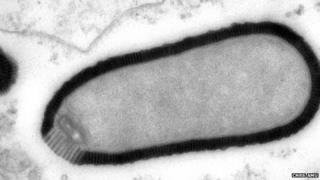 Called Pithovirus sibericum, it belongs to a class of giant viruses that were discovered 10 years ago. These are all so large that, unlike other viruses, they can be seen under a microscope. And this one, measuring 1.5 micrometres in length, is the biggest that has ever been found. The last time it infected anything was more than 30,000 years ago, but in the laboratory it has sprung to life once again. Tests show that it attacks amoebas, which are single-celled organisms, but does not infect humans or other animals. Co-author Dr Chantal Abergel, also from the CNRS, said: "It comes into the cell, multiplies and finally kills the cell. It is able to kill the amoeba - but it won't infect a human cell." However, the researchers believe that other more deadly pathogens could be locked in Siberia's permafrost. "We are addressing this issue by sequencing the DNA that is present in those layers," said Dr Abergel. "This would be the best way to work out what is dangerous in there." The researchers say this region is under threat. Since the 1970s, the permafrost has retreated and reduced in thickness, and climate change projections suggest it will decrease further. It has also become more accessible, and is being eyed for its natural resources. Prof Claverie warns that exposing the deep layers could expose new viral threats. He said: "It is a recipe for disaster. If you start having industrial explorations, people will start to move around the deep permafrost layers. Through mining and drilling, those old layers will be penetrated and this is where the danger is coming from." He told BBC News that ancient strains of the smallpox virus, which was declared eradicated 30 years ago, could pose a risk. "If it is true that these viruses survive in the same way those amoeba viruses survive, then smallpox is not eradicated from the planet - only the surface," he said. "By going deeper we may reactivate the possibility that smallpox could become again a disease of humans in modern times." However, it is not yet clear whether all viruses could become active again after being frozen for thousands or even millions of years. "That's the six million dollar question," said Professor Jonathan Ball, a virologist from the University of Nottingham, who was commenting on the research. "Finding a virus still capable of infecting its host after such a long time is still pretty astounding - but just how long other viruses could remain viable in permafrost is anyone's guess. It will depend a lot on the actual virus. I doubt they are all as robust as this one." He added: "We freeze viruses in the laboratory to preserve them for the future. If they have a lipid envelope - like flu or HIV, for example - then they are a bit more fragile, but the viruses with an external protein shell - like foot and mouth and common cold viruses - survive better. "But it's the freezing-thawing that poses the problems, because as the ice forms then melts there's a physical damaging effect. If they do survive this, then they need to find a host to infect and they need to find them pretty fast."